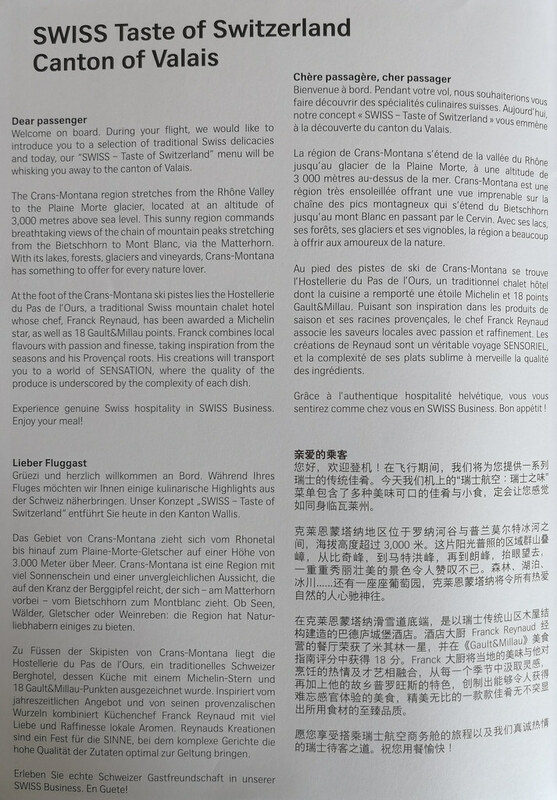 Continuing on my last post where I arrived in Zurich with just less than 30 minutes for my connecting flight, and I was more or less resigned to staying a night in Zurich. 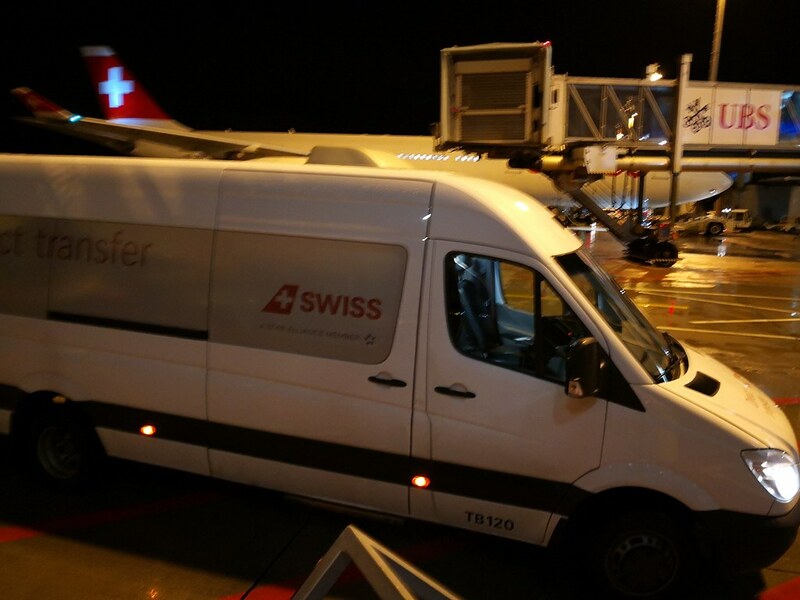 However as it turns out upon disembarking, I was received by a staff and brought into a van for direct transfer. 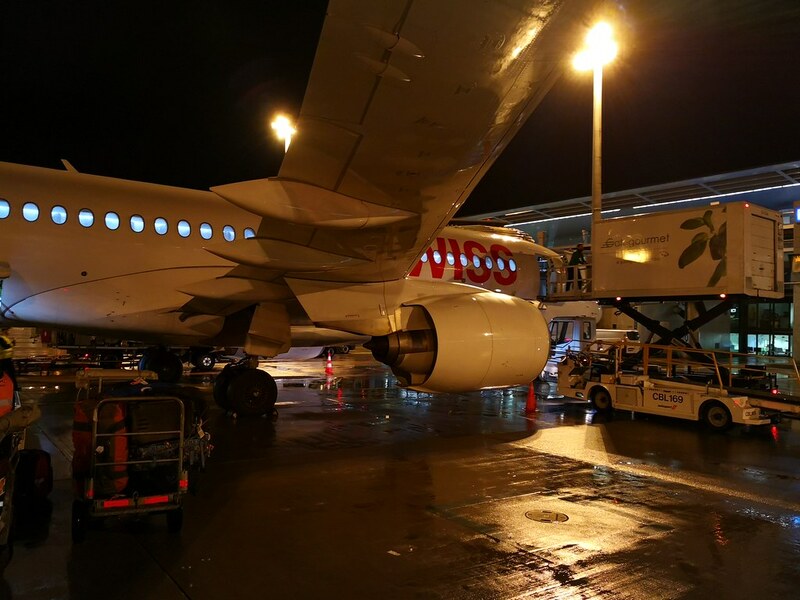 Once inside, I communicated with the driver regarding my checked luggage and he drove to the backside of the CSeries to collect my luggage directly from the plane. Next we proceed to a special passport control area where I was escorted to an immigration counter to get my exit stamp as I left the Schengen zone back to my home country. 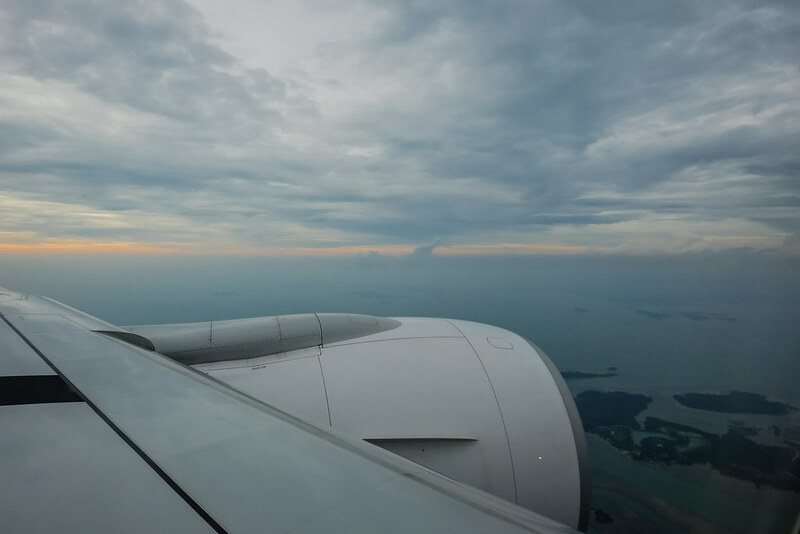 From there it was direct transfer to the aircraft where my luggage was loaded first and then I was brought up via the stairs. 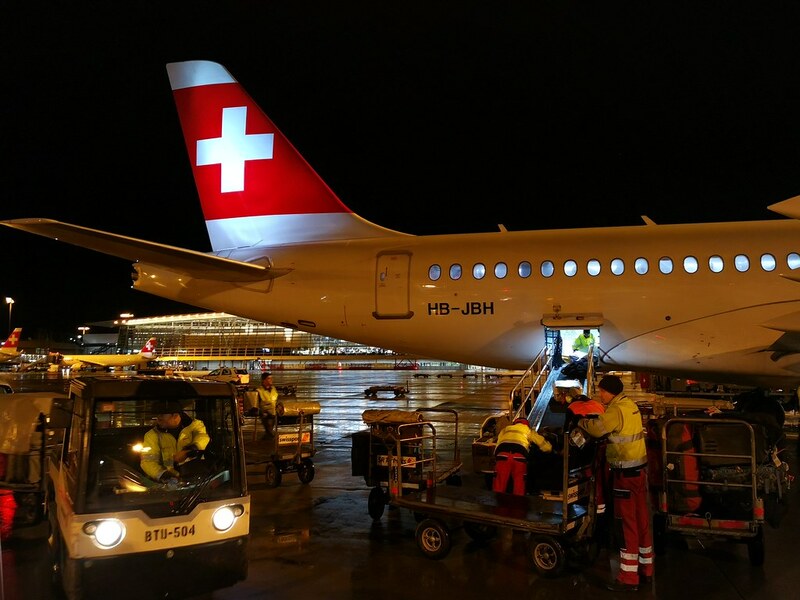 So much for a short connection, and it turns out Swiss Air does a very good job ensuring that one could always connect in Zurich within 45 minutes or even in less time than that! Boarding was still underway as I got onboard and it seems to be a full flight in Business class with several families and children in the cabin. 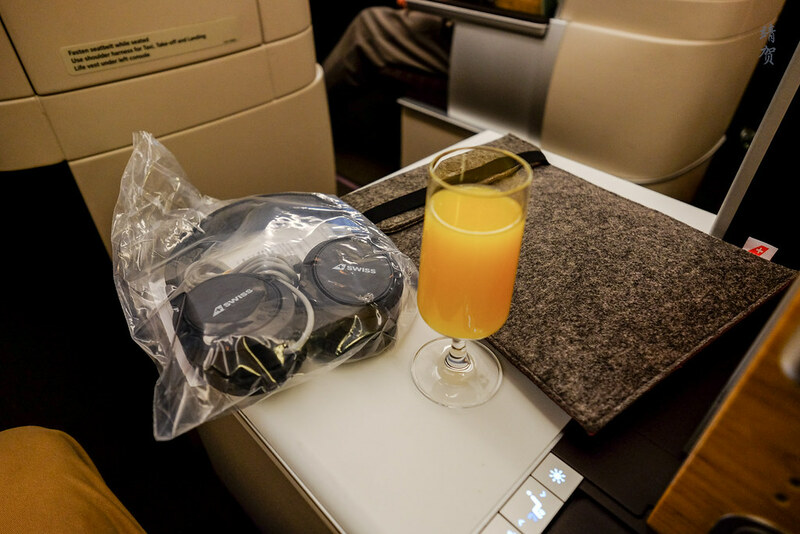 I had the fortune to get a throne seat during the online check-in and after being seated, pre departure drinks were offered. 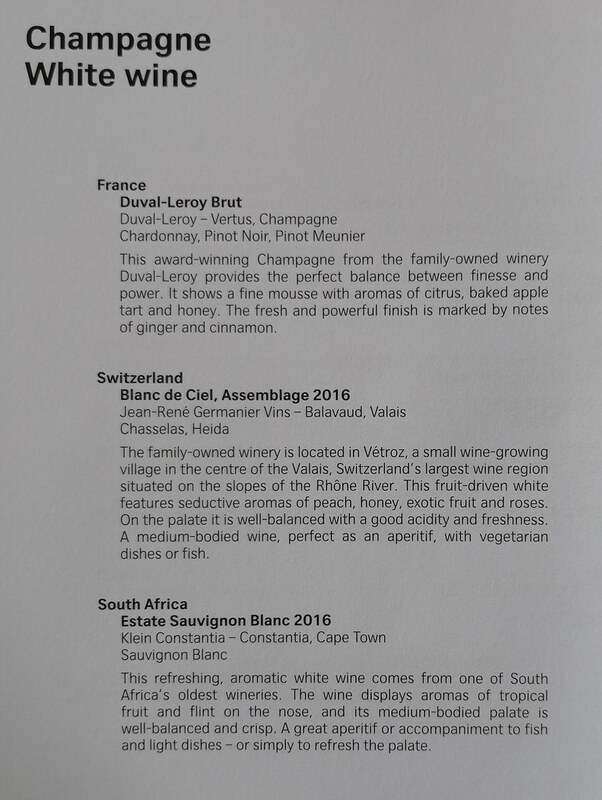 Orange juice, water or champagne were amongst the choices. The flight crew offered to hand my winter coat for me as I got to my assigned seat. 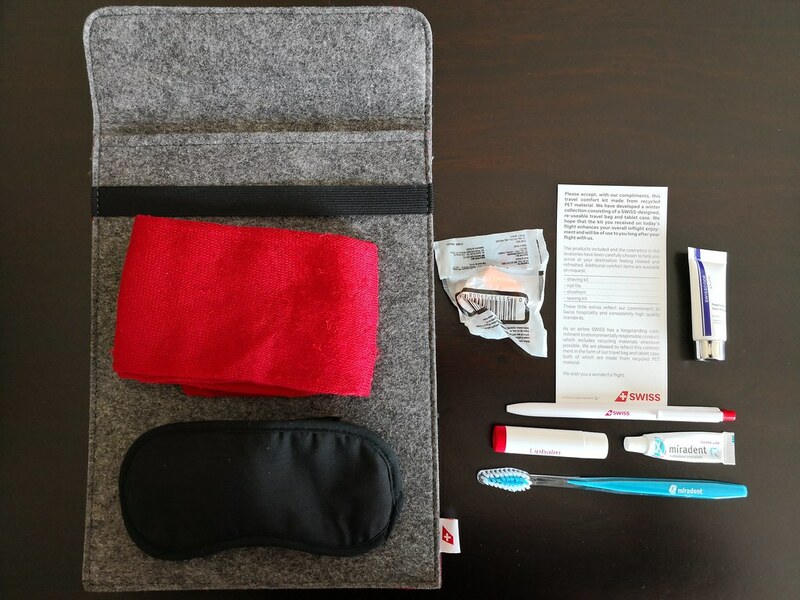 On the seat was a soft pillow, a blanket and a tablet pouch filled with a dental kit, eye mask and socks. 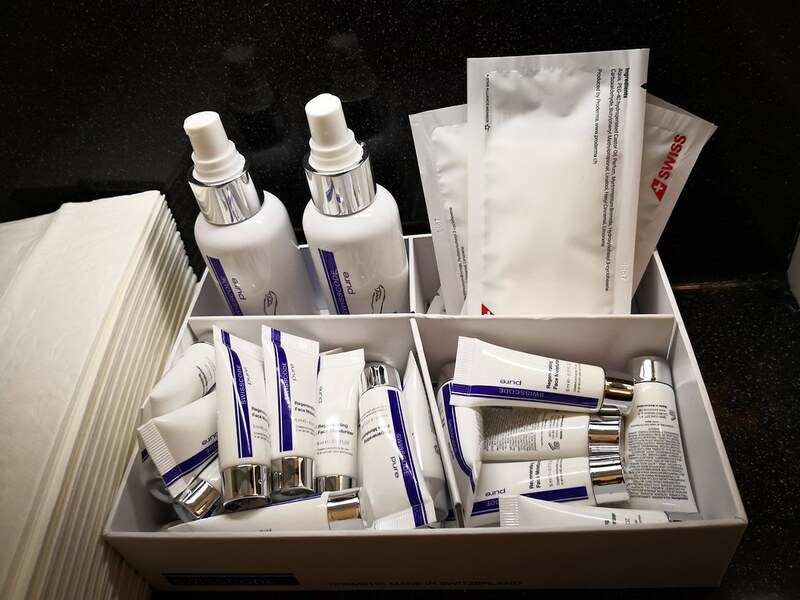 The contents was quite basic for an amenity kit and while the pouch could come in handy, it felt cheap. 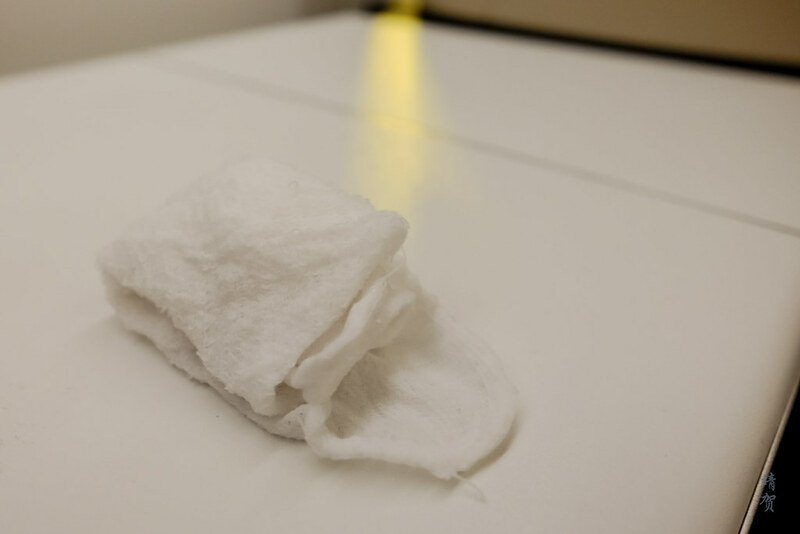 Hot towels was distributed thereafter and it came in handy to wipe the counter surfaces of which there was plenty of in the ‘throne’ seat. After pullback the captain announced some mechanical problem which warranted a return to the gate. Apparently there was a need to restart the engine due to lack of pressure. This meant we were at the gate for about another hour and then a further 30 minutes. And there I was thinking that I would have made this flight no matter what due to all these delays. 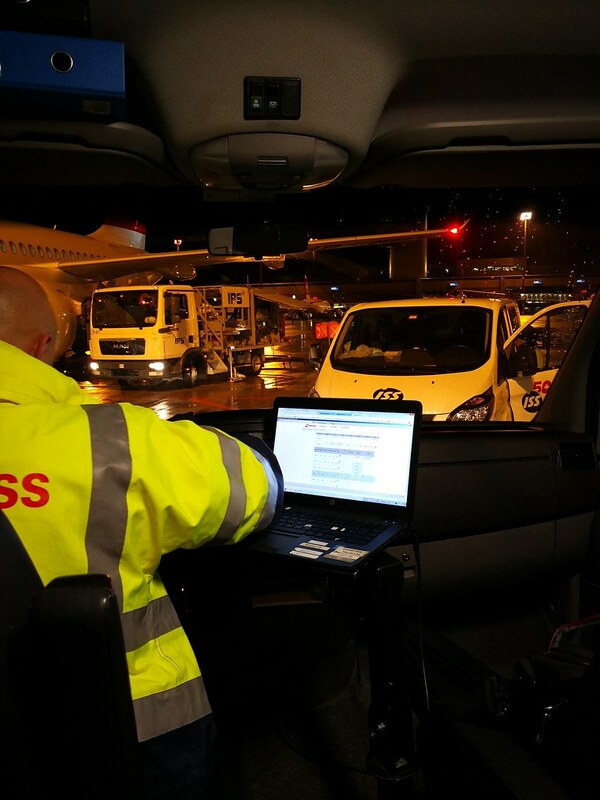 From there, more tests have to be done after the repair work was completed, where the Captain gave an estimated time of 00:30 for the new take-off time. While cabin crew distributed immigration forms and duty free order forms during the delay, there was no refreshments provided. It was disappointing when the delay lasted nearly 2 hours. At this point, I figured it was a great time to check out the various storage space around the seat and all the features. 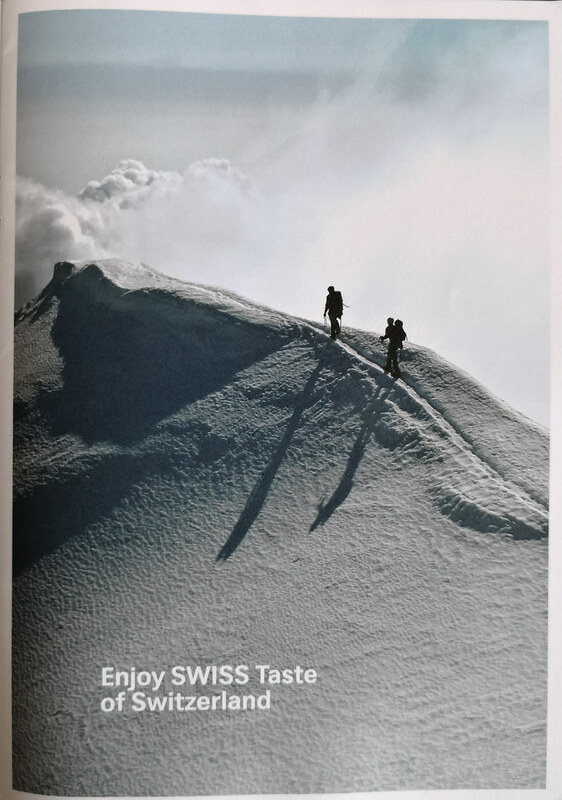 In terms of colour scheme, Swiss did a very good job. 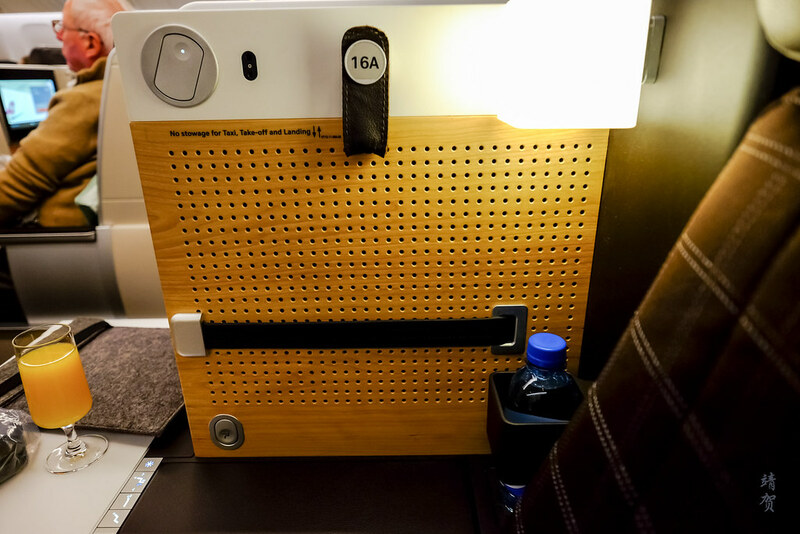 On the right side of the seat is a partition with a hidden reading light, a mounted light and a leather hook with the seat number on the top row. 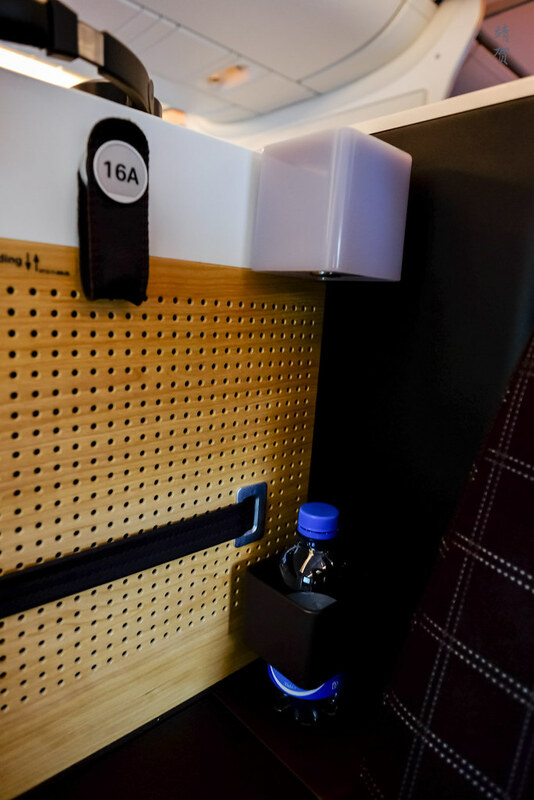 At the bottom part of the seat, there is a water bottle holder and an extendable leather strap that can secure your reading materials. 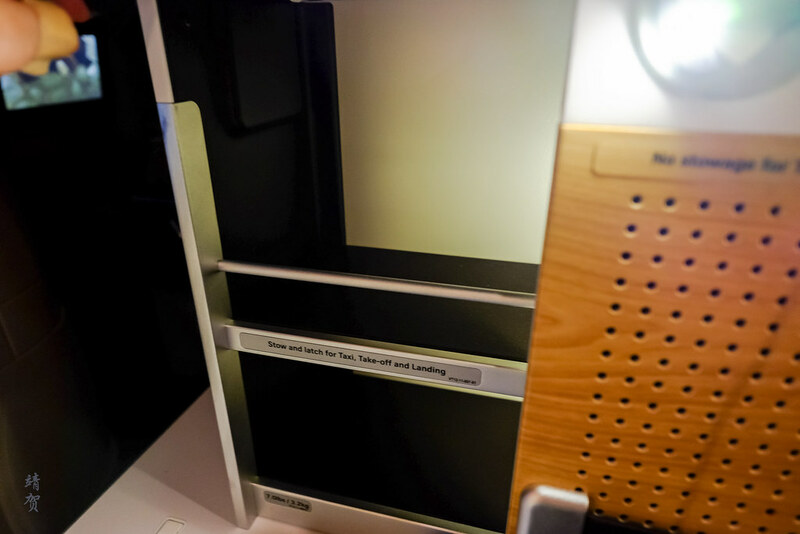 One of the nice things about flying onboard Swiss Business Class on their 777s is that they have a hidden storage compartment that can be closed to ensure your stuff like glasses, watches and mobile phones does not fall into the seat crevices while you are asleep. 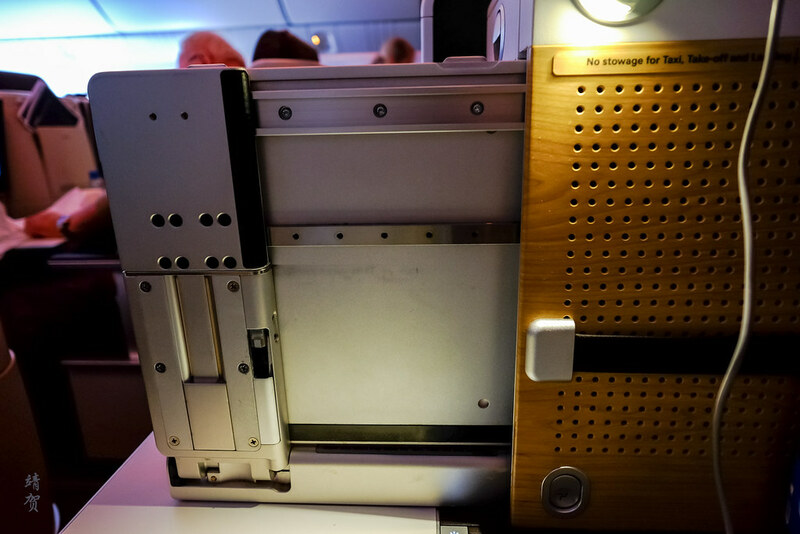 Below the partition was an armrest with one-touch seat controls and a small button that releases the tray table from inside the partition on the right side. 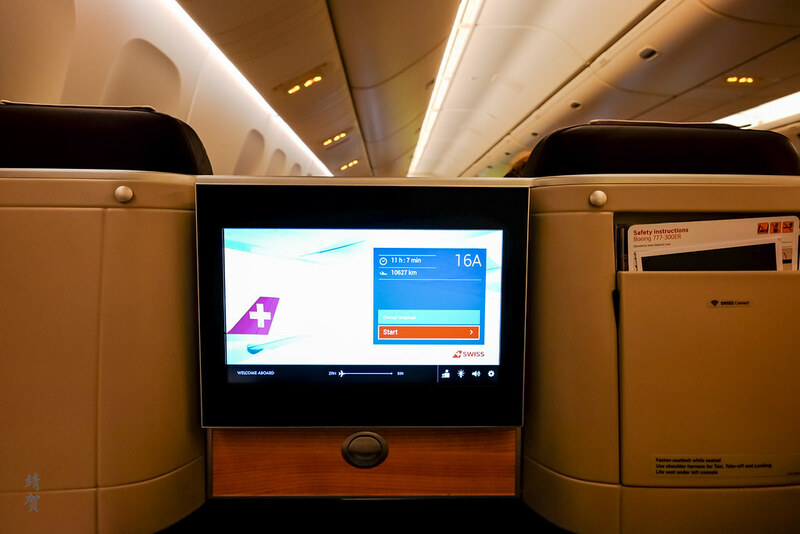 Underneath the armrest, passengers can find the inflight entertainment controller which is one of the modern ones with its own LCD panel that can show flight information. 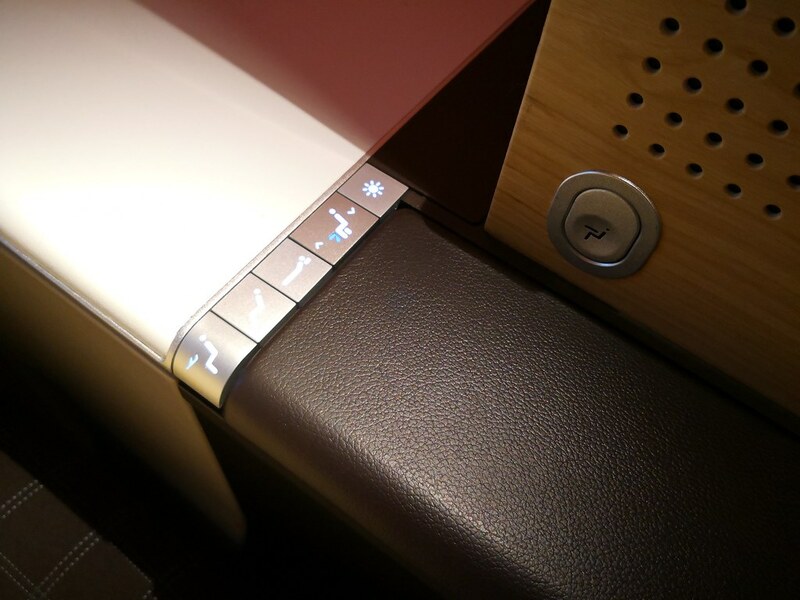 There are more seat settings underneath the armrest to adjust lumbar position and make the seat firmer or softer with a massage function, though I found they did little to make the seat more comfortable. 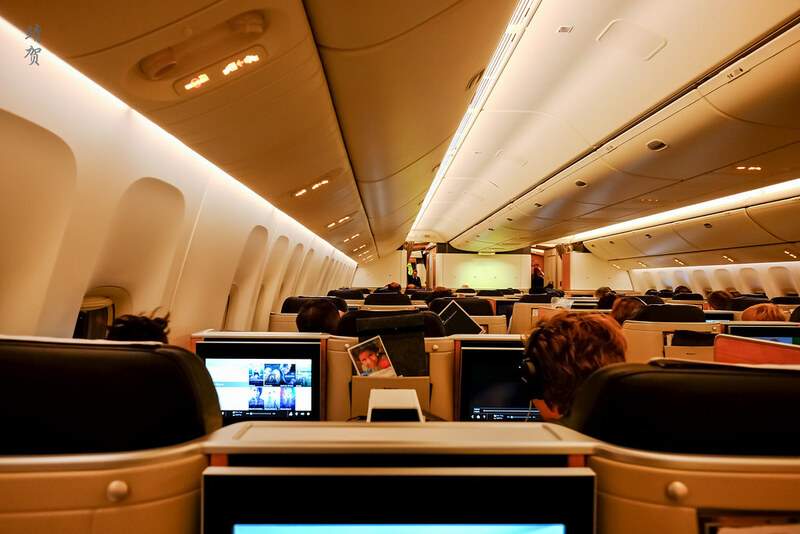 On the left side of the seat there is a large storage compartment that could easily hold a laptop bag and the thick blanket supplied on the flight. 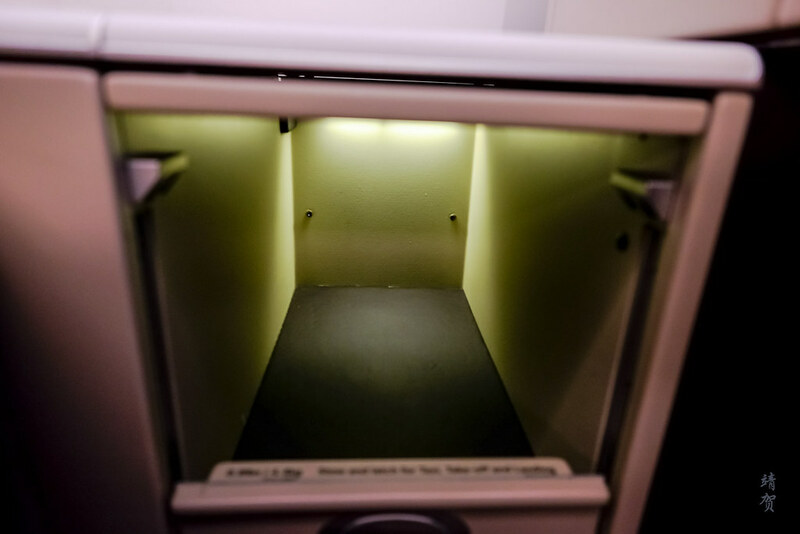 There is another enclosed storage compartment to the left of the seat near where the passengers’ left knee would be and a shoe compartment on the right side of the seat below the inflight magazine pocket. From the gate it was a quick taxi to the runway for take off since the airport is more or less deserted by this time. Take off was fast and smooth as expected of an 777 and soon we were on cruising altitude. It took another 15-20 minutes before meal service starts as I enjoyed watching the movie American Made. 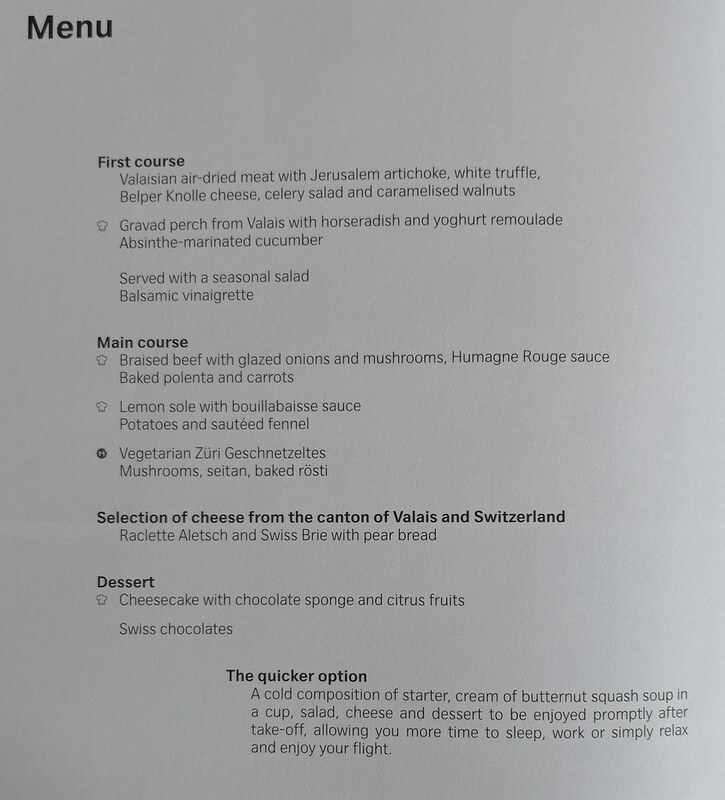 While the main course order was taken on the ground, the choice for starters was asked during the meal service. 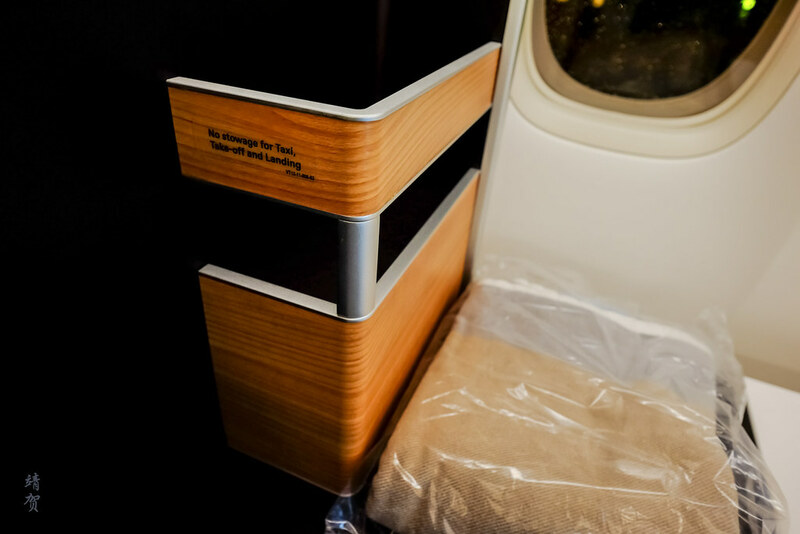 The right side of the seat also holds the pull-out tray table and it was an smooth gliding mechanism that works to hide away the clutter when not required. 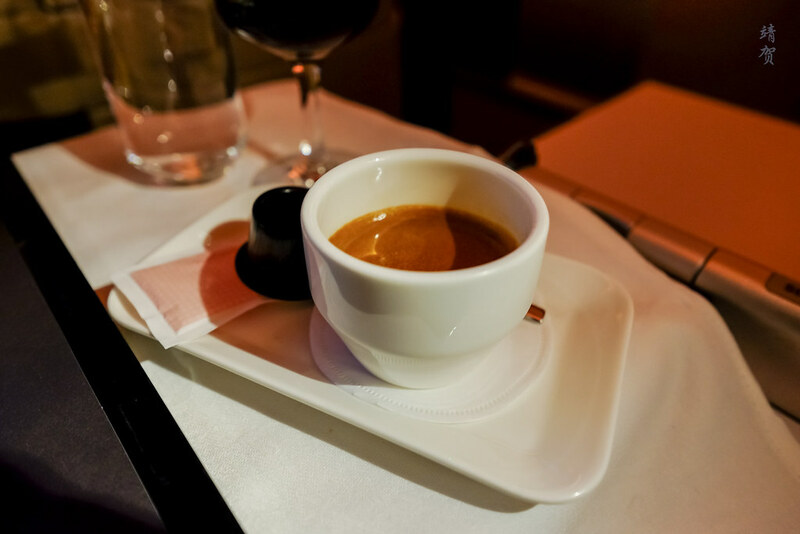 Our beverages of choice was served first and with plenty of armrest space, it need not occupy the table space since I had a glass of wine with water. Need to stay hydrated here! 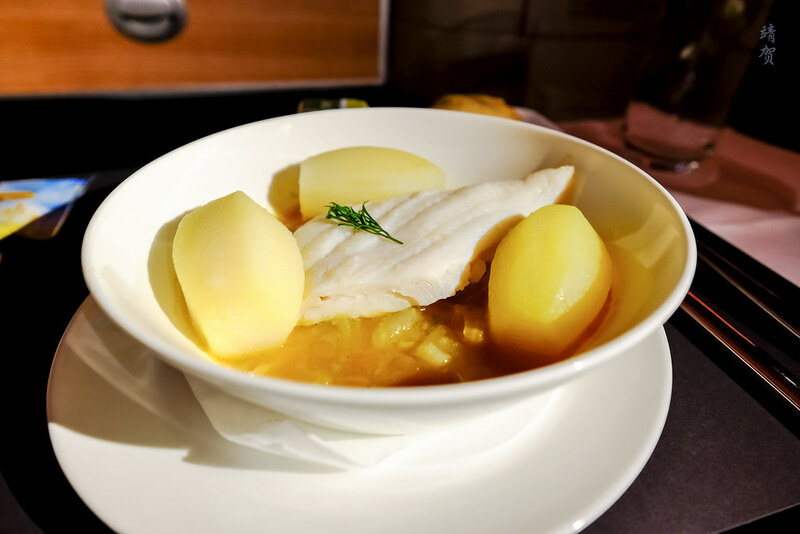 Apparently several passengers skipped the main course and went for the shortened meal which has a nice soup. 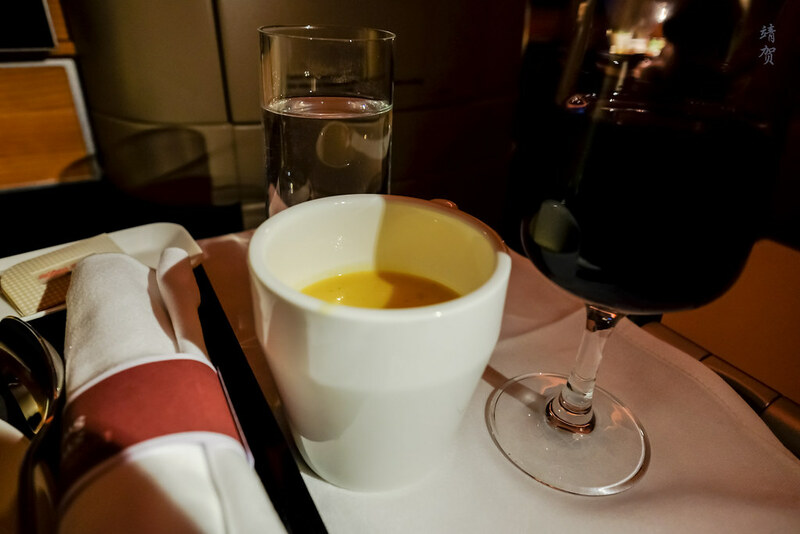 As someone who enjoys soup, I requested for a bowl of the soup to go with my meal. For the main course I originally went for the beef but changed to a fish course. Fish was cooked nicely even if it does have the seafood scent. Dish looks plain just like most Swiss dishes but it was seasoned perfectly. When the crew saw me not touching my mains as I wanted some pepper, the crew enquired if she could bring the beef out for me as well. Seems like there are extras due to the delays as I heard it being offered to other passengers. Dessert was served next and once again Crew asked if she could bring me anything else. The male steward conducting duty free sales walked past and I gave him my order as I purchased some gifts for my family members on this flight. 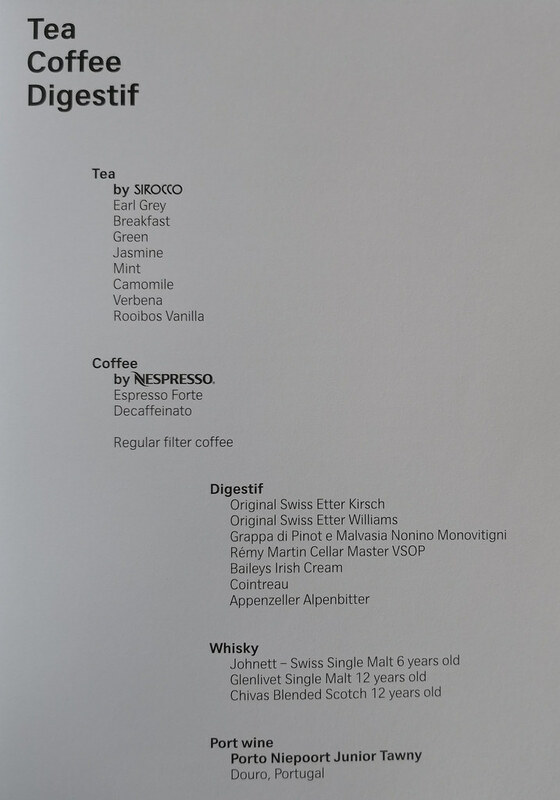 Coffee was offered and I had some more of the Nespresso onboard with a praline that was served later on. 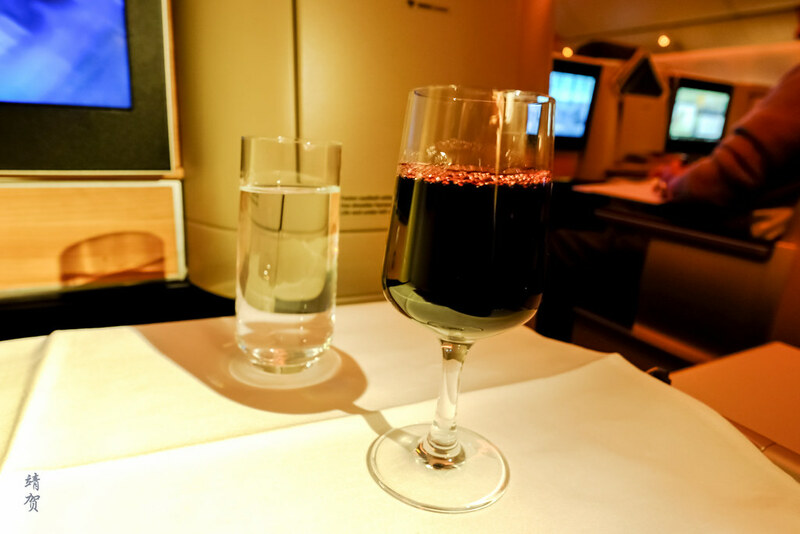 After the meal service, I went to the lavatory to freshen up and change to comfortable lounge wear that I had brought along for this flight. 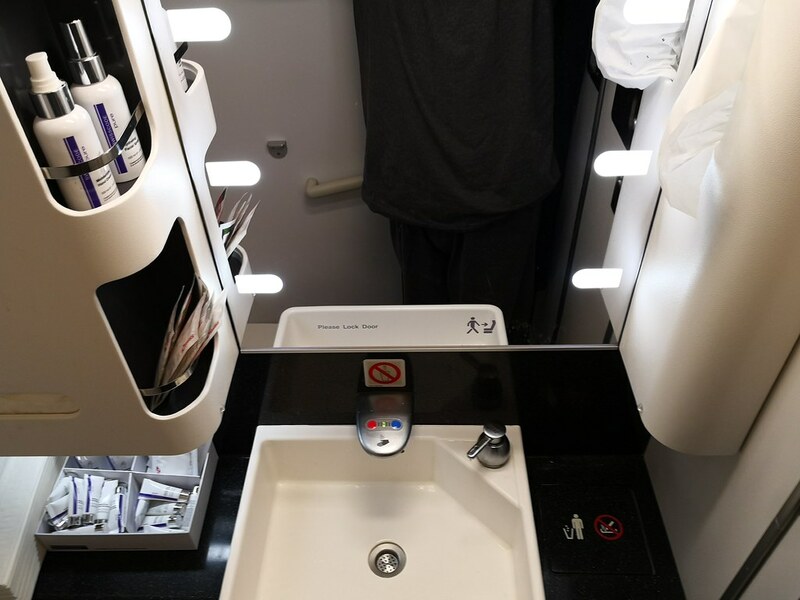 The lavatories on newer and modern jets are definitely nicer with the ergonomic design and Swiss have added plenty of amenities inside for Business Class passengers. 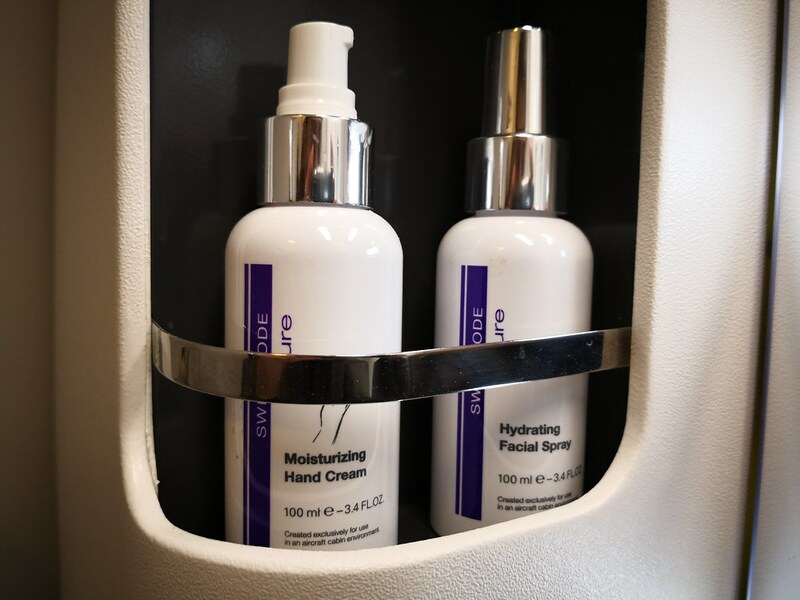 These includes a face mist which refreshes for a long-haul flight in a dry airplane cabin and individual packs of moisturizers. There was lotion and wet wipes in packets provided on the tray as well. By the time I came out, it gave me time to take my wallet to pay for my duty free purchases. 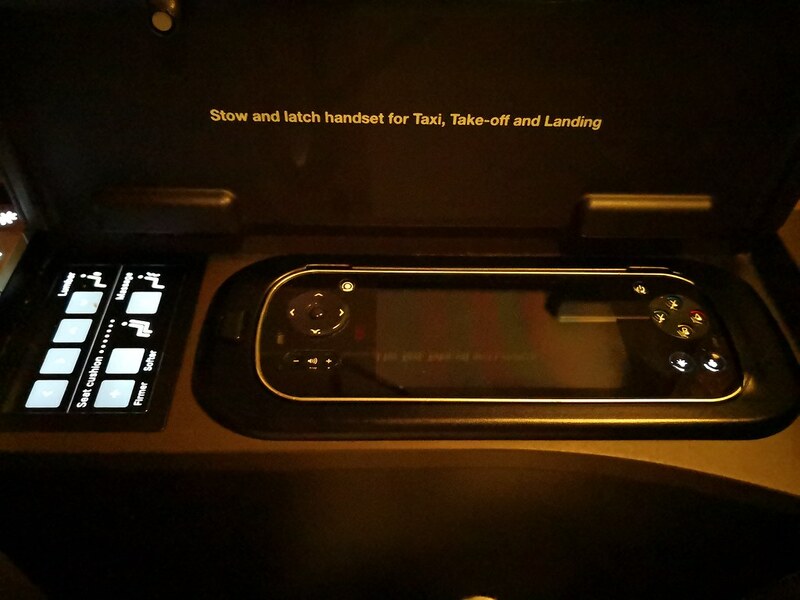 With all that I wanted to do for this flight done, I reclined the seat to the lie-flat mode for the night. I was tired by this point in time and even though the seat was a bit hard and not very comfortable, I managed to get some sleep of nearly 5 hours or so since it was nearly 3am Europe time when I fell asleep. I was basically tired which meant that the firm seat with little cushioning was still comfortable enough since I do have a preference for a firmer bed. 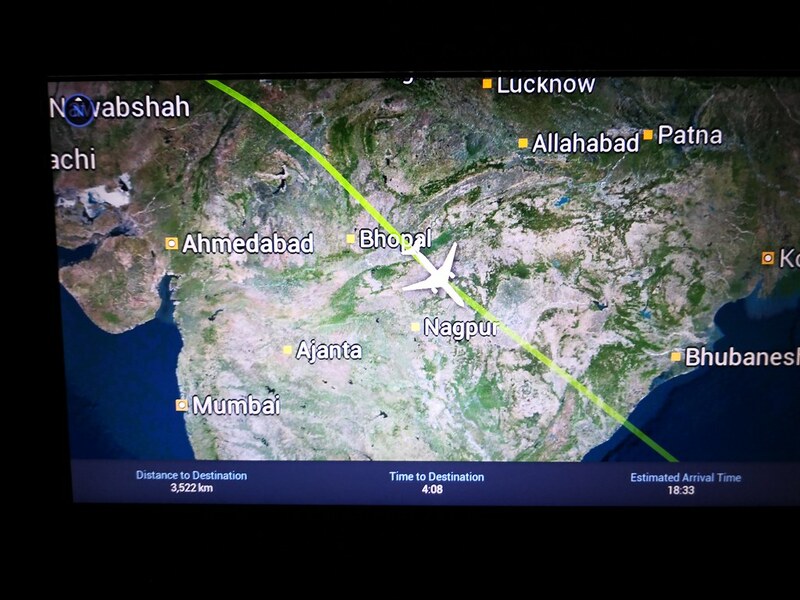 I woke up as we flew over Central India with about 3 and a half hours left into the flight. 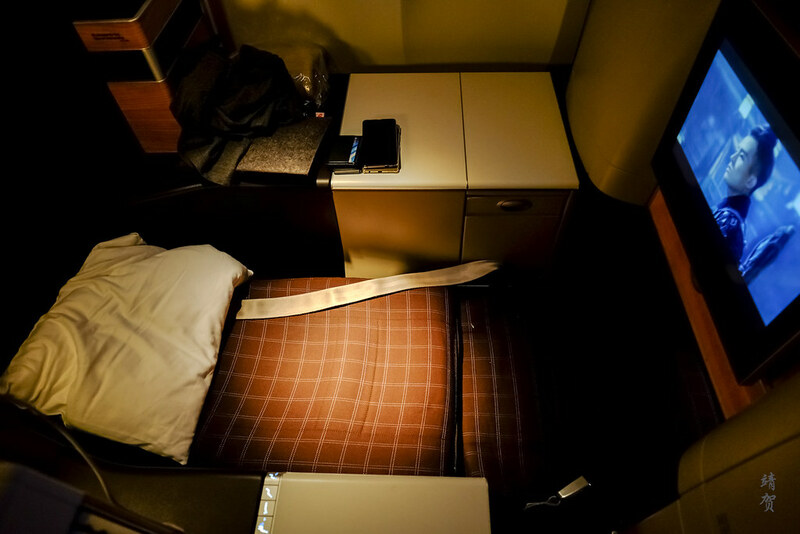 The cabin was still dark at this time and I basically just lounged in my seat, aside from refreshing myself in the lavatory after the short nap. 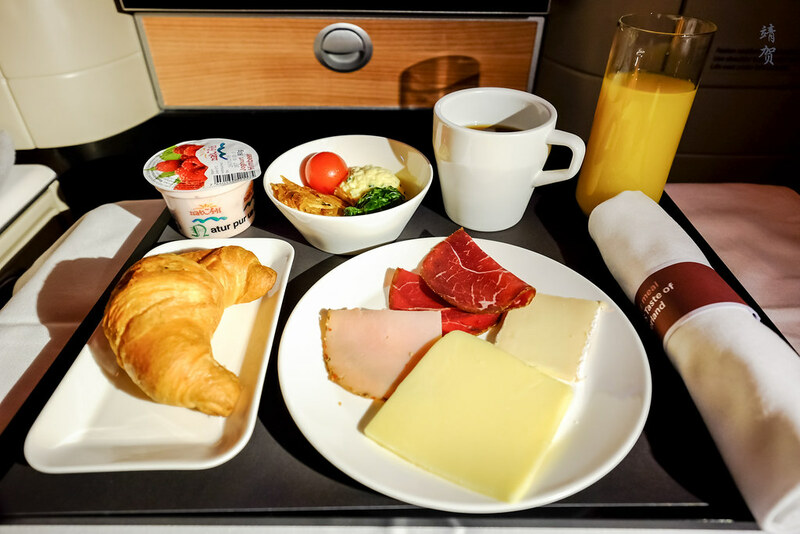 About 2 and a half hours before our scheduled landing, breakfast was served in the Business cabin. There was no choice for breakfast with all the dishes served on one single tray. 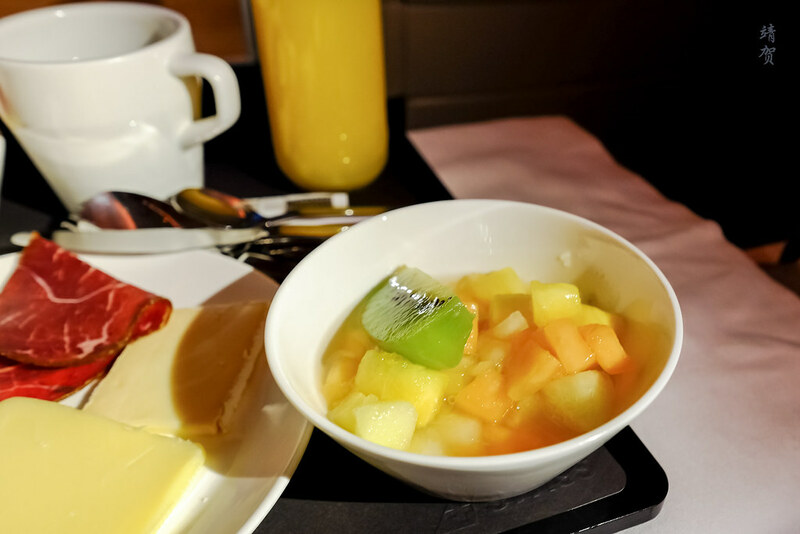 Juices and coffee were offered along with the tray while a selection of bread including croissant was served from the basket. Along with the main plate of assorted cheese and cold cuts, there was a plate for the bread or pastry, a yogurt and a warm egg dish. 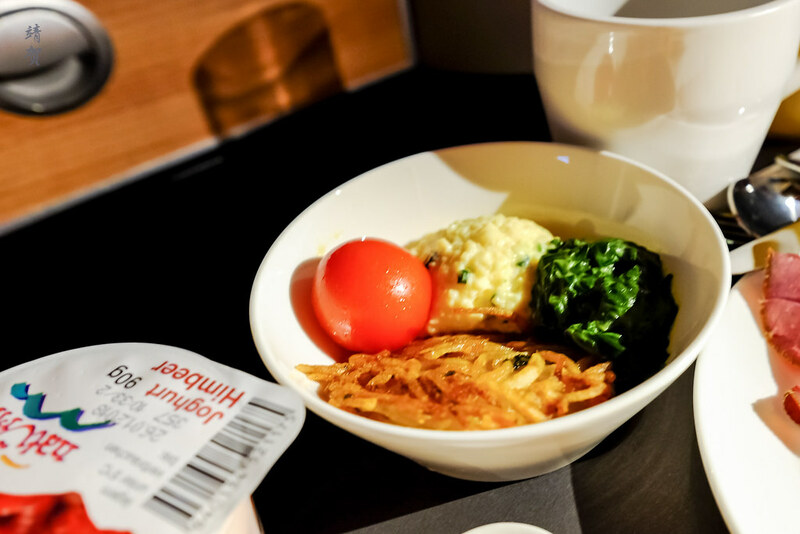 In this flight this dish was scrambled egg served with a small portion of rosti. A fruit bowl was also offered separately but it was diced fruits and not what I had expected. I thought the breakfast was a bit lacking in terms of portion and variety. 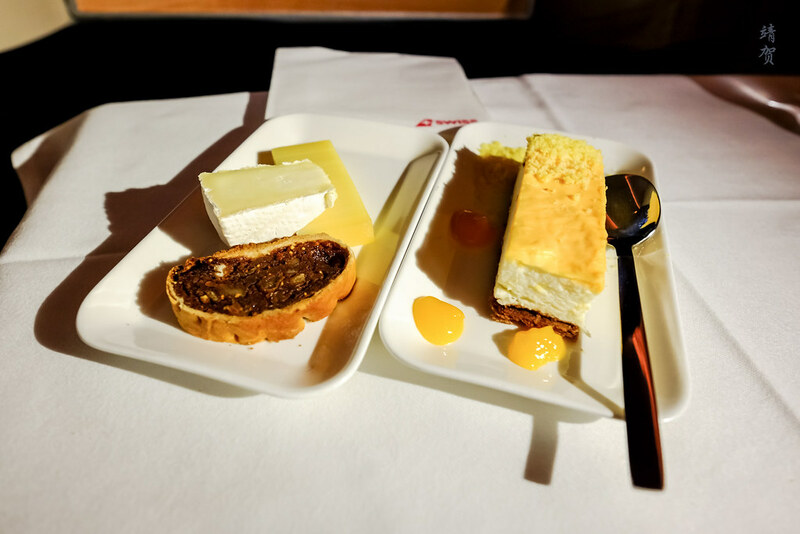 While I understand this is the classic Swiss breakfast as I know from my stays in Swiss ski hotels, they were somewhat underwhelming on a Business class long haul flight. 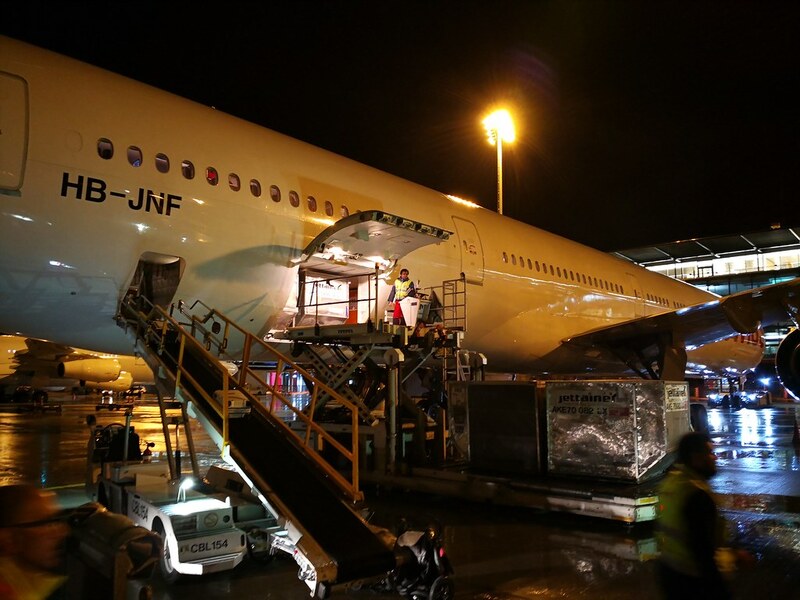 After breakfast service was completed, there was a flurry of activity as passengers moved around to extract or store their belongings while making trips to the lavatories. 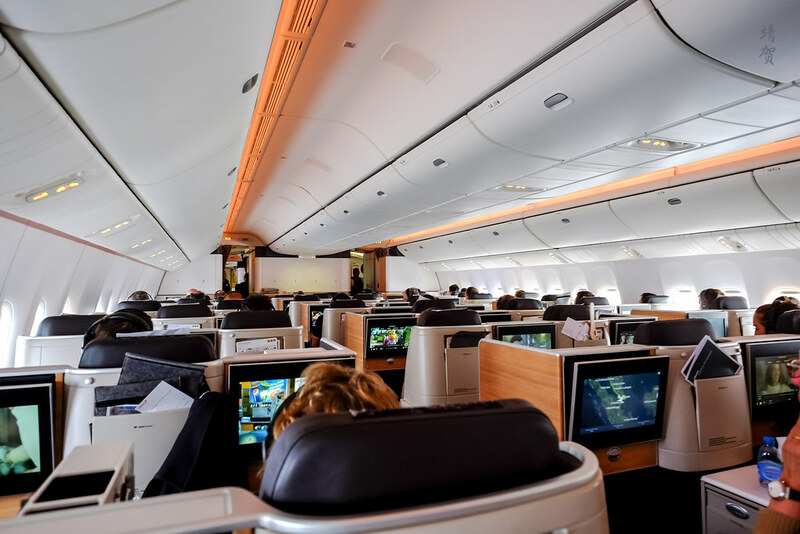 For a relatively large Business class cabin, this means passengers should probably have a quick breakfast if they do not want to queue and wait. 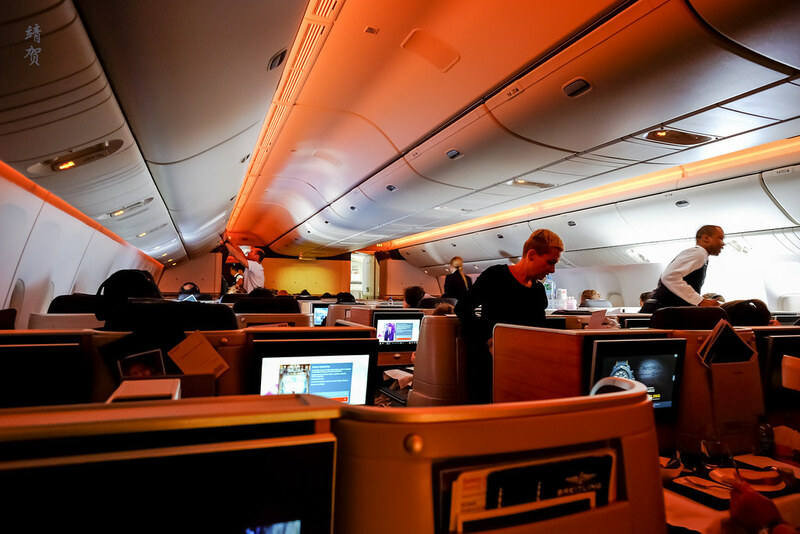 Most passengers would also start to open the blinds and since the flight arrives in the afternoon, light begins to stream inside the cabin. 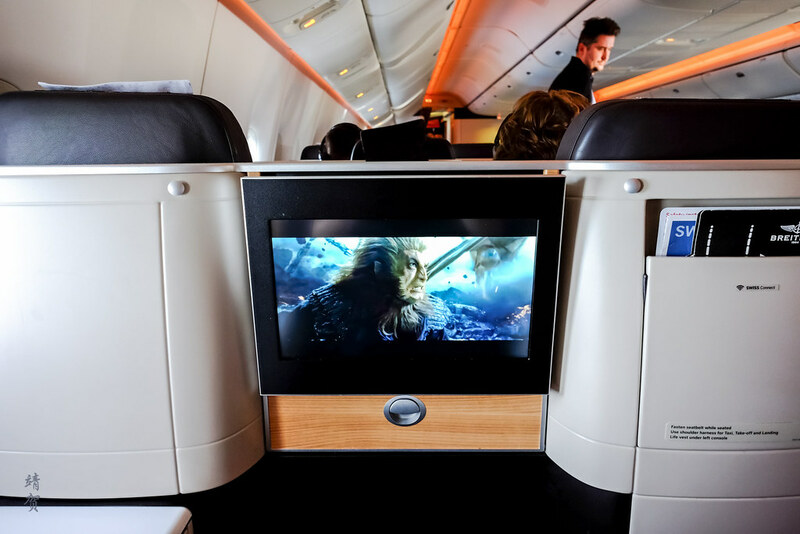 I continued watching the inflight entertainment onboard and there was a good range of movies including Asian cinemas. That entertained me through the rest of the flight as it would be difficult to get back to sleep with the activity and the light in the cabin. 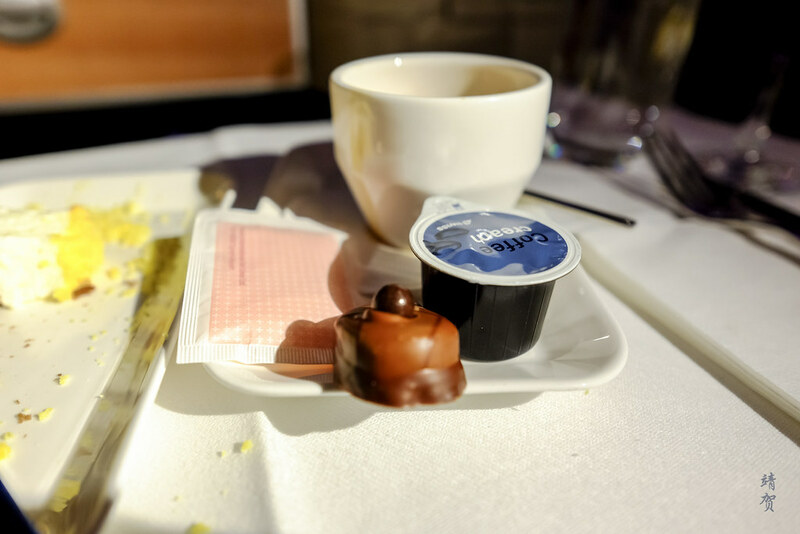 There was still about an hour and 40 minutes into the flight by the time breakfast service was done, so the crew certainly made sure to leave plenty of time for passengers to get ready. 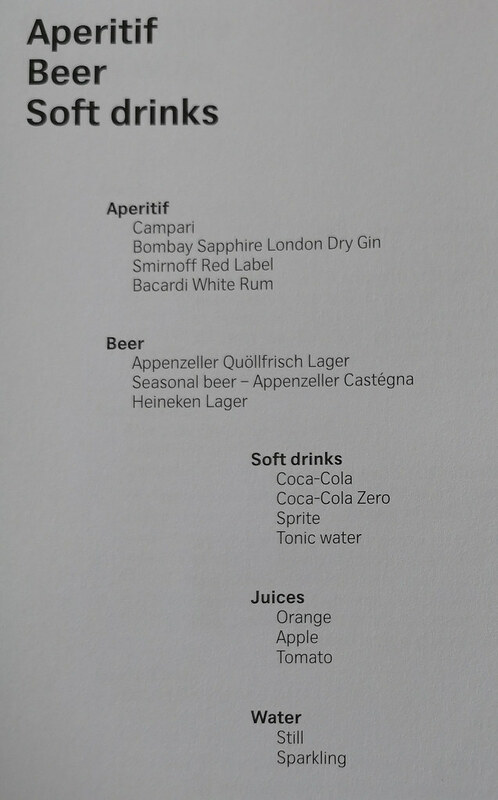 If anything, Swiss does seems to make the flight seem like clockwork and the cabin was prepared for landing in Singapore about half an hour before. 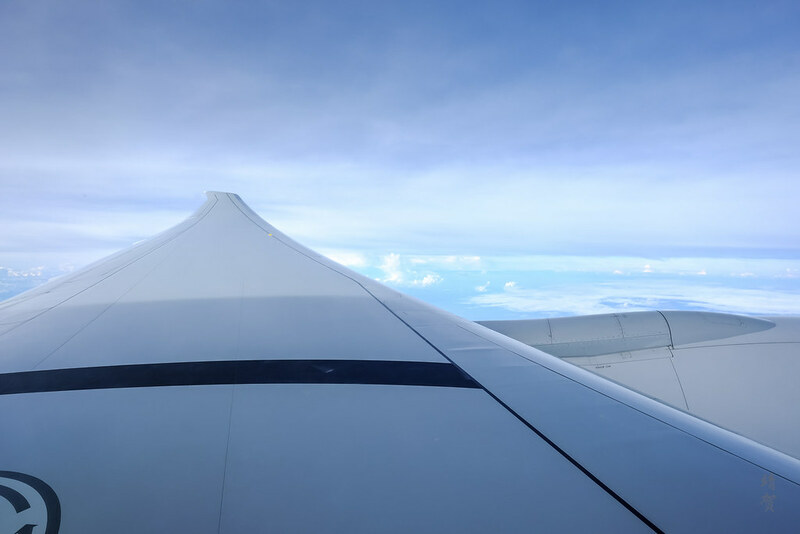 With the ‘throne’ seat at the back of the plane, it is somewhat difficult to get good views of the landing since seat was right over the wing. 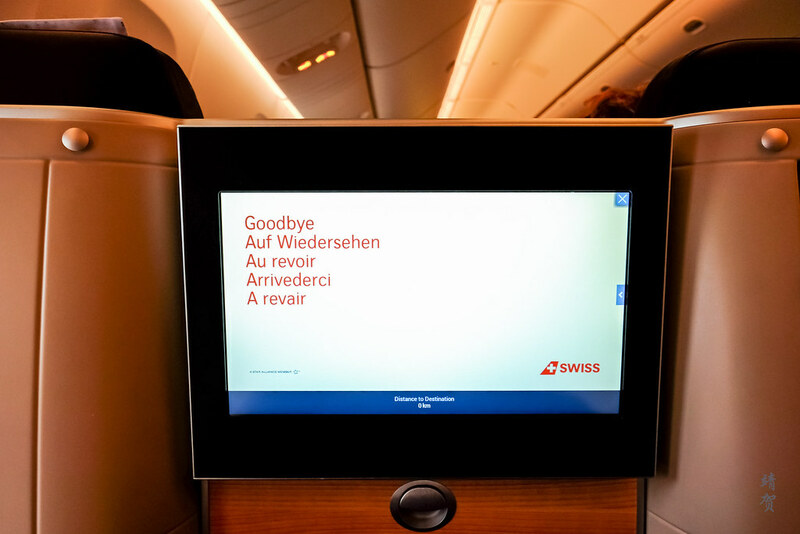 As the flight comes to an end, the inflight monitor shows the ‘goodbye’ message along with the 4 different languages that is used in Switzerland. 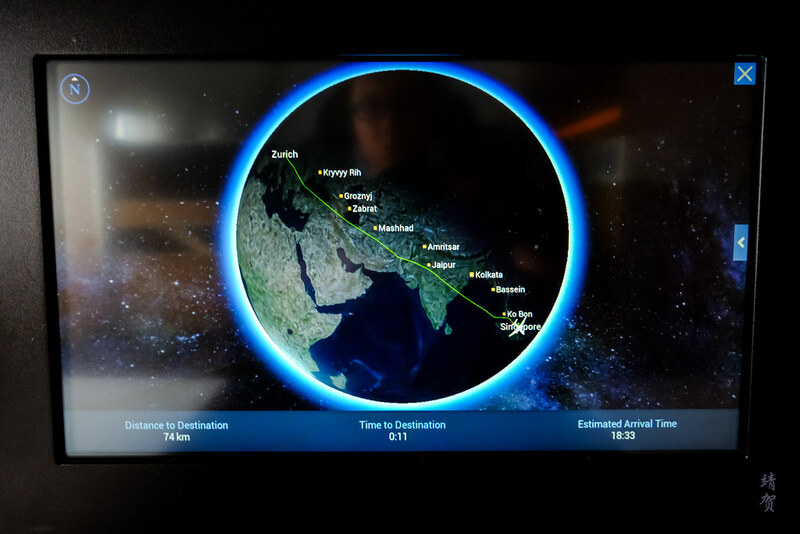 Though there was plenty of delay during departure, the flight only landed 35 minutes late, so that meant I still managed to catch my connecting flight to Jakarta, Indonesia. 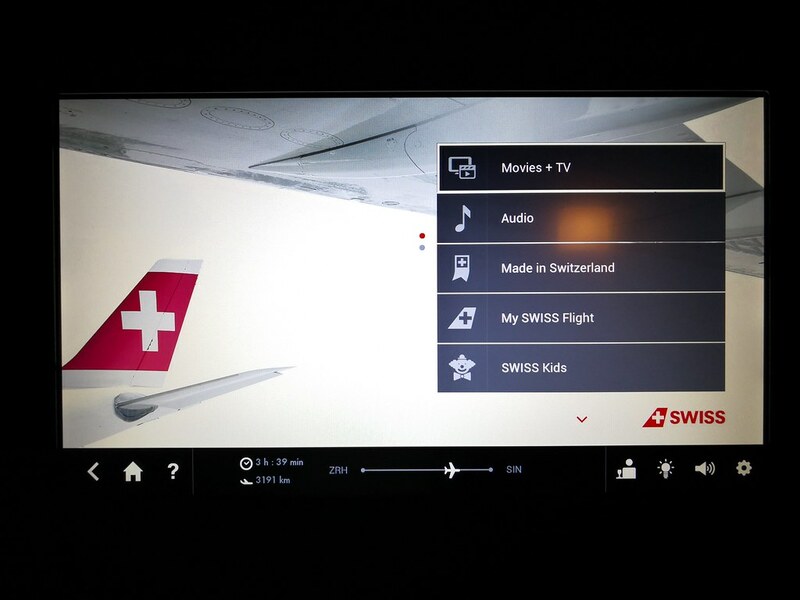 All things considered, Swiss Business Class is not a bad way to travel at all. 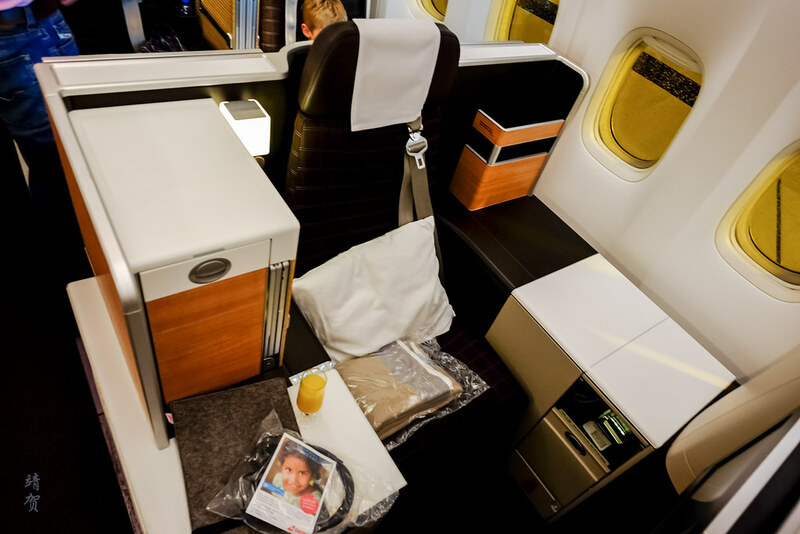 There was quality in the finishings of the seat, for example, but passengers would also notice some cost cutting in terms of the amenity kit and the bedding which does not have additional duvets for the seat. While the first meal was good, the pre-arrival breakfast was somewhat simple and on hindsight, not really worth the trouble of getting up for if one is truly sleepy and tired. 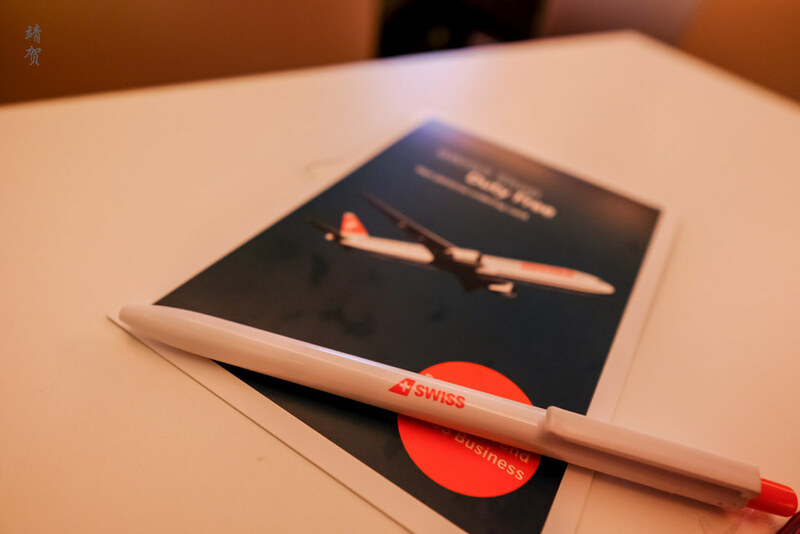 What was impressive, however, was the way they handled short connections in Zurich that gives me confidence in booking connecting flights with them. 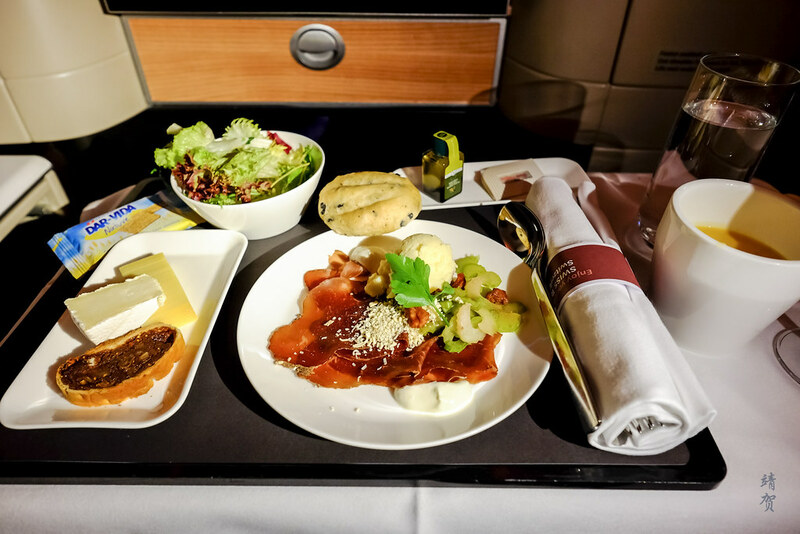 However, when flying direct, I would actually still fly with the Asian airlines like ANA, Thai and Singapore Airlines within Star Alliance as I find they provide a better product overall with nicer meals and better amenities. 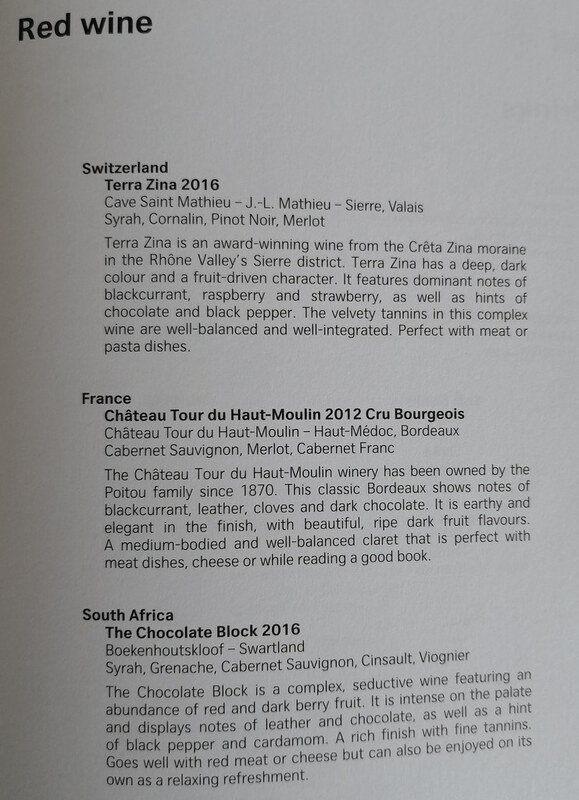 Thanks for this very comprehensive account of your Swiss flight to Singapore as I am fliying in your footsteps (or should it be slipstream) in feb 2019 in my case coming into Zurich from Bordeaux. The Business bus transfer looks excellent. 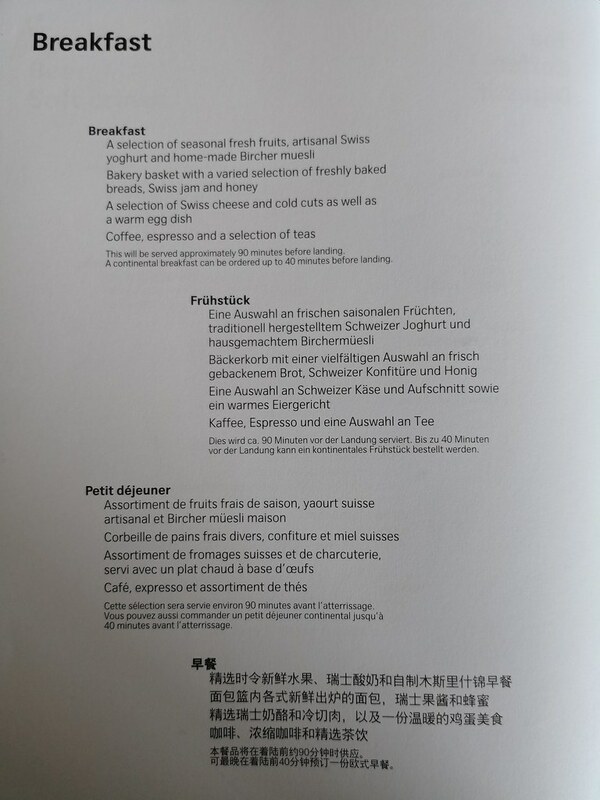 This is the only place I found information on what meals are served and when in the night flight, something I could not find on Swiss webpages! 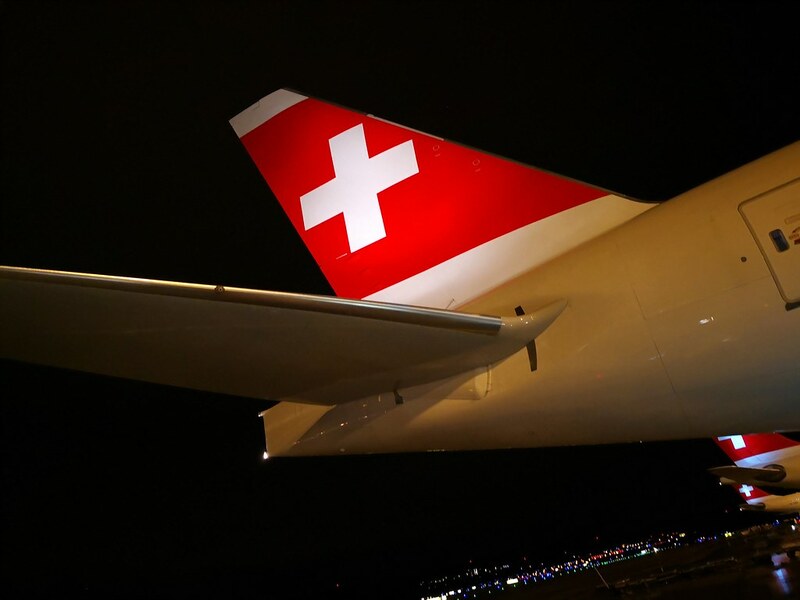 @ray, Swiss does a good job taking care of its transfer customers and the airport is easy enough for transfers if I must say. Unless there are major weather troubles, I figure you should be taken care of.